Gary Nelson (second from left ) and Ivan Baldwin (third from right). Gary Nelson (left) and Ivfan Baldwin. Ivan Baldwin (M) and Gary Nelson (R), were a tough team to beat. Lloyd Dane driving the #22 At Darlington in 1951. Erick's early Pontiac sponsored by Don Basile. Erick spins at Carrol Speedway. Erick Erickson is on the right, I'm not sure who the others are. I think that's Brock Yates of Motor Trends Magazine getting up close. Fred Steinbroner in the Bob Carpenter '50 Ford #16. Fred Steinbroner in the #16 again getting the checkered flag. Erick Erickson in an undated photo. That looks like Lou Figaro in the Hudson, not sure about the 3 car. Lou Figaro #33 and Fred Steinbroner in the #16. I The #16 car is Fred Steinbroner, don't know the others. 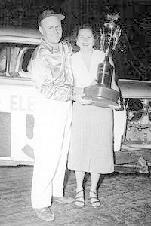 Claude Walling a popular North West driver. Oakland Speedway 7/16/50. I'm really getting tired hearing that stock car racing began in the south, that's pure BS. Compare the cars that raced at Oakland to the cars that raced in "stock car country". A very young Hershel McGriff. Tony Sampo (22), Johnny Soares (2) and Bud Rose (3). Len Sutton. Photo credit from "Conversations with a Winner -- The Ray Nichels Story. Stock Car racing was a big attraction in pre-Castro Cuba, that's right Cuba. I found this wonderful book " From Havana To Miami" published by Rafael Sanchez. 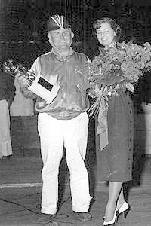 The 1st Gand Prix Of Cuba ran on February 28, 1956 with stock cars as a surport class. Cubans loved auto racing, if not for Castro, what might have been? The tracks were road courses at first that ran along the ocean and then later on airports. For some reason the #33 Rambler had lots of pictures, maybe a popular Cuban driver.